There was strong opposition from some residents and labor groups, many of whom chanted "shame" and waved signs. 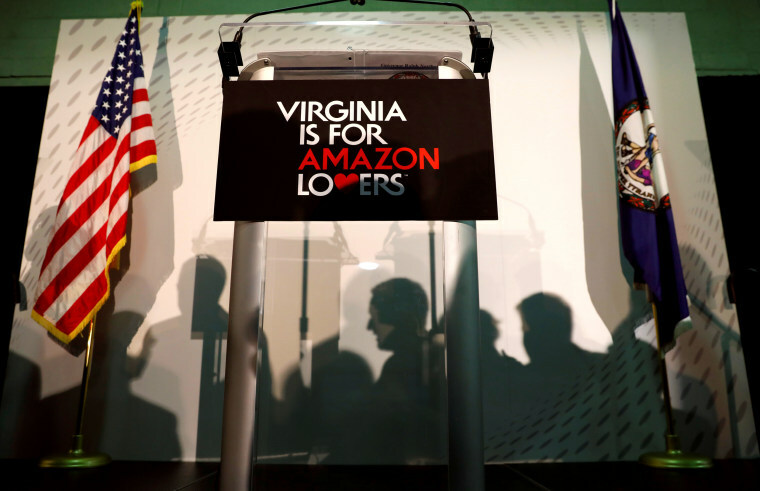 WASHINGTON — Amazon.com Inc's planned second headquarters in northern Virginia cleared a key test on Saturday when local officials approved a proposed financial package worth an estimated $51 million amid a small but vocal opposition. There was strong opposition from some residents and labor groups, many of whom chanted "shame" and waved signs with slogans including "Don't be the opposite of Robinhood," "Amazon overworks and underpays," and "Advocate for us and not Amazon." One protester was escorted out of the meeting by police. A few dozen protesters outside the county office chanted, "The people united will never be defeated." Danny Candejas, an organizer for the coalition "For Us, Not Amazon," which opposes the company's move into the area, said: "We are fighting to make sure people who live here are not priced out by wealthy people." Some supporters in the meeting held up signs saying "vote yes" and "Amazon is prime for Arlington." One hundred and twelve people were registered to speak, an unusually high number for a local county meeting, forcing board chair Christian Dorsey to cut the speaking time to two minutes, from three, for every regular speaker, and to four minutes, from five, for representatives of organizations. "Speculators are already driving up home prices, landlords are raising rents and general contractors are raising their quotes for home improvement projects," said one resident, Hunter Tamarro. But supporters such as resident June O'Connell said Amazon's presence would ensure Arlington is allocated state funds for investments in transportation and higher education. "I want that money from the state," O'Connell said. "Without Amazon, we wouldn't get a penny of it." Holly Sullivan, Amazon's worldwide head of economic development, spoke briefly and said the company will invest approximately $2.5 billion, create more than 25,000 jobs with an average wage of over $150,000, which will generate more than $3.2 billion in tax revenue. "Regarding incentives, Amazon is only eligible for the financial incentive after we make our investments and occupy office space in the community," she said. Dorsey, the board chair, had said before the vote that he expected the measure to pass. He said that rejecting Amazon would not solve the community's problems and concerns, and that this was the first deal the county has struck where new revenue growth will be used to fund it. A filing on the county board's website says the $23 million grant and the $28 million in strategic public infrastructure investments were "instrumental in Amazon choosing Arlington for its headquarters."